Have you noticed the striking silhouettes which greet you when you arrive in Aylesbury Town Centre on the Waterside Theatre roundabout? 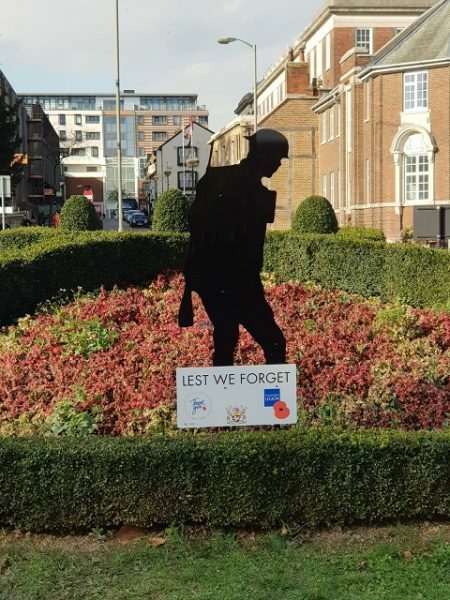 Aylesbury Town Council has installed the Royal British Legion silhouettes as part of its World War One centenary commemorations and to remind us of the sacrifices people have made during the Great War. You will see a “Tommy” soldier to remind us of the young men from Aylesbury who went to war and never came back and the RAF pilots who as part of the then Royal Flying Corps, were based at RAF Halton. As part the centenary commemorations, the town council started a Community Wall Hanging back in 2014 at the Flanders Field Event held at the Bucks County Museum, a special commemorative day to mark 100 years of the start of the Great War. White squares were decorated by children and many members of the public and even sent in from abroad, which were then tied together to create the wall hanging. The squares depict messages of remembrance and thanks to all those who gave their lives. People can see the wall hanging which is on display at Hale Leys Shopping Centre until the November 12. The Town Mayor is inviting people to join him for a wreath laying at the War Memorial in Tring Road Cemetery on Friday November 9 at 11am. This invitation is extended to everyone to attend the Remembrance Service on Sunday November 11 at 5.30pm at St Mary’s Church, Aylesbury. People are asked to be seated by 5.20pm. The service is part of the many events which are taking place that day to pay tribute to those involved in conflict but also to remember the end of the Great War. The service includes readings by local cadets and members of the community, a short play by Roisin Willets and Community Unity Project and music by the Aylesbury Concert Band.